2014-11-05: ISO TC 92: ‘Fire Safety’ is a long-established Technical Committee within the International Standards Organization (ISO) … www.iso.org/iso/home/standards_development/list_of_iso_technical_committees/iso_technical_committee.htm?commid=50492 … and down through the many years of its existence, since 1958, it has laboriously constructed a robust foundation which has facilitated the modern evolution of Fire Science and Engineering and the development of many standard fire safety practices and procedures around the world. Recently, having examined some draft standards being processed through ISO TC 92 … I have become very tired of the blatant incompetence … and lack of care and concern merging with feigned ignorance and/or stubborn resistance, within the Technical Committee, when it comes to the issue of ‘disability’ … in other words, the major matter of the real fire safety of vulnerable building users and occupants, i.e. people with activity limitations, in real buildings. With regard to All Aspects of the WG’s Work … one issue, in particular, sticks out like a sore thumb … how you treat ‘disability’. There is no clarity here, only confusion. There are no precise terms, only a garbled use of language and concepts. Please allow me to suggest, with accompanying explanations, a suitable and necessary path forward. I will circulate this e-mail message separately within ISO, and beyond. 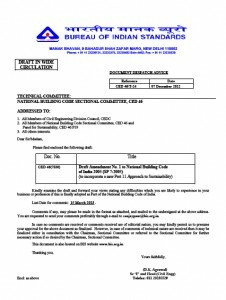 Within this document, Accessibility is understood to mean the full cycle of independent building use, in an equitable and dignified manner … and to include the approach, entry to and use of a building, egress during normal conditions and removal from the vicinity of the building … and, most importantly, evacuation during a fire incident to a ‘place of safety’ which is remote from the building. Texts relating to ‘fire safety’ have been incorporated into the main body of this International Standard. It is, however, just a small beginning. Much work remains to be done. Accessibility Design Criteria, as described in ISO 21542, must now be applied to the design and maintenance of all fire evacuation routes, fire safety related signage and fittings, etc., etc. Use of the word escape, in any context, is strongly discouraged. People with Activity Limitations: Those people, of all ages, who are unable to perform, independently and without aid, basic human activities or tasks – because of a health condition or physical/mental/cognitive/psychological impairment of a permanent or temporary nature. Attached, please find the FireOx International ‘Fire Safety for All’ Matrix … which illustrates how the separate pieces, including ‘disability’, fit together. Contraflow: Emergency access by firefighters or rescue teams into a building and towards a fire, while people are still moving away from the fire and evacuating the building. And why, suddenly, all of these ‘musts’ ?? Cogently mandated in the United Nations Convention on the Rights of Persons with Disabilities (CRPD) … the UN CRPD’s principal aim is to ensure that the Built, Social, Economic and Virtual Environments are sufficiently ‘accessible’ to permit a vulnerable and major population group in all of our societies to enjoy the fundamental freedoms and human rights set down in the Universal Declaration of Human Rights (1948). Also attached, please find a United Nations Global Map showing the status of Convention Ratification back in July 2014. 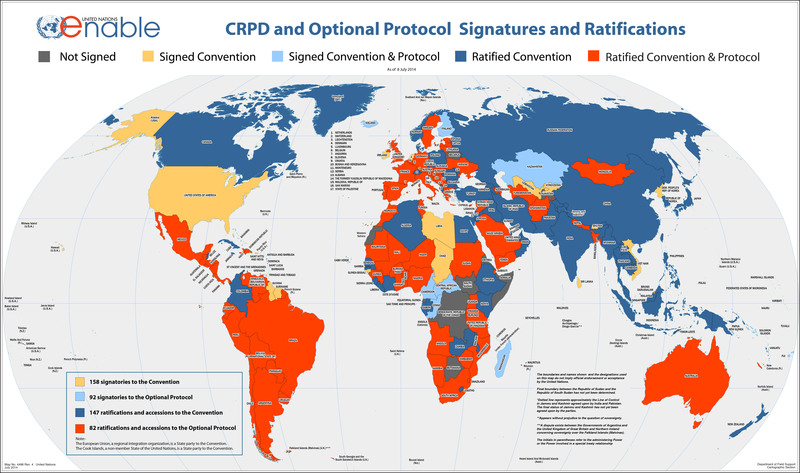 At the time of writing this e-mail message, 151 Countries have ratified the UN CRPD. Full and Effective Accessibility of the Built Environment is a human right. Adequate provision must be made for people with disabilities to use all buildings … not just some buildings … and certainly not just limited parts of a building ! In practice, people with disabilities must be included in all practice evacuation drills … and they must be included in all activities related to ‘fire safety’ and/or necessary to prepare for safe evacuation. Furthermore … because Electronic, Information and Communication Technologies (EICT’s) now serve a function which is critical, during a fire incident, for the safety of all building users and firefighters, property protection, minimizing environmental damage, and sustainability … they must have a user interface which is Accessible for All … from both ends. Minimum Reasonable Provision for People with Activity Limitations in a Building … 15% of User/Occupant Population. The numbers of people with disabilities in developing and the least developed economies far exceed numbers in developed economies ! Best wishes for the success of your meeting in Sydney. C.J. Walsh – Consultant Architect, Fire Engineer & Technical Controller. Session 4 – The European Union in the World. Colour photograph showing Tánaiste Eamon Gilmore delivering a Keynote Address, from the podium, at the 2012 Dublin IIEA/TEPSA Irish EU Presidency Conference. 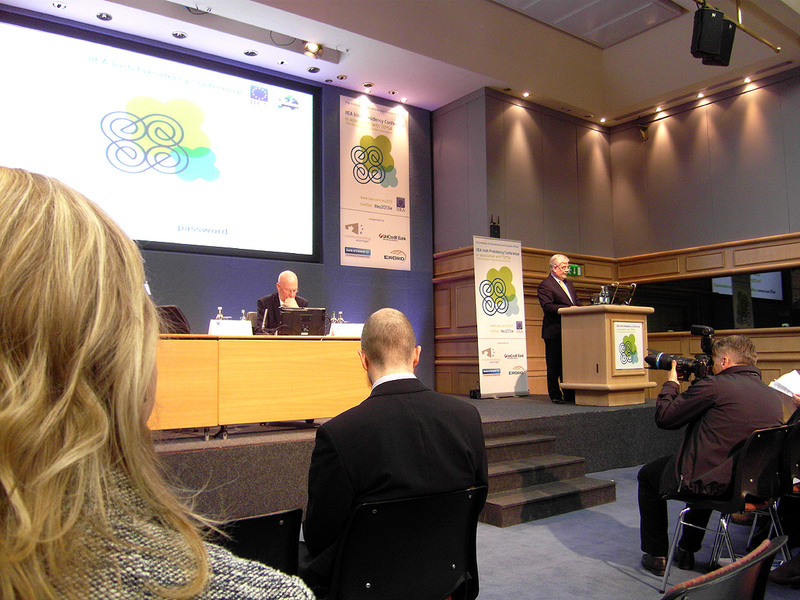 In the Chair – looking very pensive – is Mr. Dáithí O’Ceallaigh, Director General of the IIEA. Photograph taken by CJ Walsh. 2012-11-23. Click to enlarge. Although the serious problem of Youth Unemployment in Europe was discussed (from an economic perspective), and the Ageing Society received a passing mention … there was hardly any consideration of EU Citizenship and the many other Soft Social Issues … with, surprise-surprise, no reference at all to the Weak and Vulnerable Groups of People in all of our countries. Furthermore … I don’t know whether they were invited to the Dublin EU Presidency Conference … and if they were, whether they couldn’t attend … but I did not notice a significant presence of representatives from Irish Disability Organizations at this important event. Conference Delegates needed to hear that the European Union is for All of its People … not just its Citizens ! That distinction is critical. 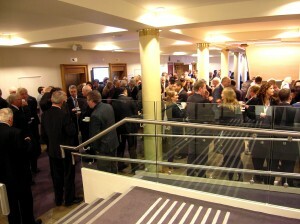 Colour photograph showing Delegates at the 2012 IIEA/TEPSA Irish EU Presidency Conference in Dublin – described by one journalist as “a heavyweight audience of policymakers and ‘leading thinkers’ ” – chatting over morning coffee and tea. Notice the lethal-looking metal handrail extensions in the foreground. Photograph taken by CJ Walsh. 2012-11-23. Click to enlarge. With some concern, I have been following the discussion about Access Officers. Once upon a time … at a meeting of the EuCAN Management Team in Luxembourg … there was an intense discussion about ‘Accessibility & Human Rights’. Now that the U.N. Convention on the Rights of Persons with Disabilities has been adopted, entered into force, and been ratified by the European Union and many, though not all, of the EU Member States … I hope that this issue has finally been resolved. Therefore … the immediate, Pan-European Accessibility Agenda can be found in Articles 9, 11 and 19 of the Convention … all within the context of Preamble Paragraph (g). BUT … is any organization yet working with this Agenda … and, most importantly, implementing it properly ? AND … let us not forget that Independent Mechanisms to Monitor Implementation are an essential component of the same Agenda (Article 33.2) … at European, national, and sub-national levels, right down to individual public and private organizations ! Accessibility has been clearly specified in the new International Standard ISO 21542: ‘Building Construction – Accessibility & Usability of the Built Environment’ as including … ‘access to buildings, circulation within buildings and their use, egress from buildings in the normal course of events, and evacuation in the event of an emergency‘. The flawed framework, founded on the term ‘Access’ alone, is now obsolete. And, therefore, the Access Officer is no more. Let us all finally agree that the responsible individual, whether he or she, is an Accessibility Officer ! If the EuCAN Network is to have a useful and constructive future, this is the New Legal & Normative Environment which it must confront, carefully examine … and, in support of which, it should produce design guidance, decision-making computer software tools, etc., etc … for the practical purpose of ‘real’ implementation. AND … any proposed EuCAN Programme of Action (2013-2015) should also include a review and updating of past publications. 1. Although the European Union ratified the U.N. CRPD on 23 December 2010 … European Commissioner Viviane Reding (Justice, Fundamental Rights & Citizenship) stated at a Dublin Meeting, in answer to my direct question, that some Member States are offering stiff resistance to integration of the Convention into the EU System. Why isn’t the European Disability Forum on top of this ? But also … the European Union has not yet either signed, or ratified, the Convention’s Optional Protocol. 2. At the time of writing … Finland, Ireland, the Netherlands, and Norway (EEA) … have still not ratified the Convention. Why not ? Where is the outcry from disability organizations in those countries ?? In Ireland, unfortunately, national decision-makers would rather commit ritual suicide outside government buildings than acknowledge an individual citizen’s human rights. And, if Ireland ever does ratify the Convention, proper implementation will be very problematic. Am I exaggerating ? Not at all … just look at how Ireland has implemented the U.N. Convention on the Rights of the Child, which it ratified back in September 1992. 3. In EU Member States that have ratified the U.N. CRPD … the Convention is not always being implemented properly. Towards the end of the following Blog Post … https://cjwalsh.ie/2011/10/public-procurement-design-for-all-its-crunch-time-folks/ … I have discussed the Concluding Observations on the Initial Report of Spain (September 2011 Session of the U.N. Committee on the Rights of Persons with Disabilities). 4. Preamble Paragraph (g) of the U.N. CRPD is even more important, now, for this reason … the United Nations has started to develop the Post-2015 Sustainable Development Goals. It is essential to fully integrate Ability/Disability Issues into this process. Making a submission to the U.N. could be an interesting task for EuCAN. 5. The Fire Safety Texts contained in ISO 21542 are essentially just a bare minimum … and they are mostly in the form of recommendations (‘should’), not requirements (‘shall’). There is a great need to add extra detail to those texts … and to convert them into requirements. 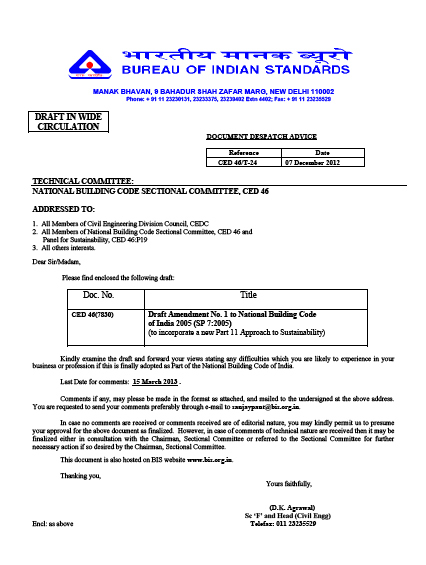 Making a series of submissions to the International Standards Organization (ISO) should be a task for EuCAN. C.J. Walsh, Sustainable Design International Ltd. – Ireland, Italy & Turkey. The fundamental basis of a European philosophy for accessibility is the recognition, acceptance and fostering – at all levels in society – of the rights of all human beings, including people with activity limitations … in an ensured context of high human health, safety, comfort and environmental protection. Accessibility for All is an essential attribute of a ‘person-centred’, sustainable built environment. Now that a Comprehensive Legal and Normative Environment for Accessibility has finally been created in Europe … there is a vital need for EuCAN for serve … and a vital role for EuCAN to play. However … Concerted Action must be directed at Implementation … Effective Implementation … ‘real’ accessibility which works. Enough talk – Enough tokenism !! 7-3-2009 – Would that be ‘Today’ … or ‘July 3 2009’ ? 2009-03-07: Well … which is it ? This is not a trick question. This was ‘adopted’ by CEN (Comité Européen de Normalisation) as European Standard/Norm … EN 28601. CSN EN 28601 – Czech Republic. Today is … 2009-03-07 … and there can be no confusion !